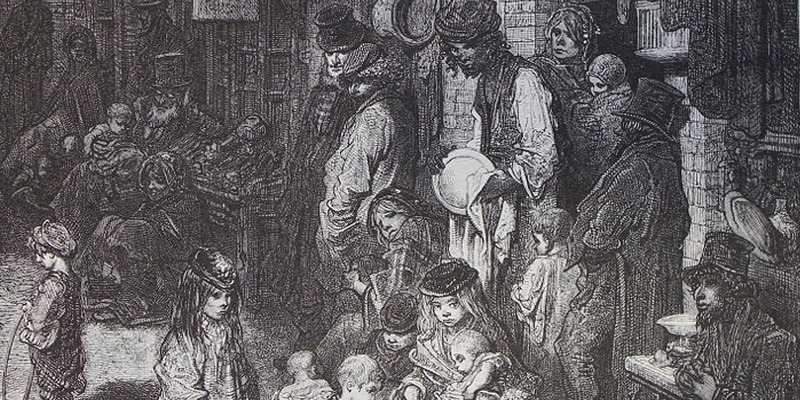 Inner city Victorian poverty in Gustave Doré’s Wentworth Street. Charles Dickens’ second book, Oliver Twist (1838) contained the classic Victorian themes of grinding poverty, menacing characters, injustice and punishment. These were all live issues at the time Dickens was writing the novel, especially with the introduction of the1834 New Poor Law – an Act which, for many liberal Victorians, appeared to criminalise the poor. Dickens was a vigorous critic of the New Poor Law and he relentlessly lampooned the harsh utilitarian ethics behind it – the belief that the workhouse would act as a deterrent so fewer people would claim poor relief and thereby the poor rate would reach its ‘correct’ level. 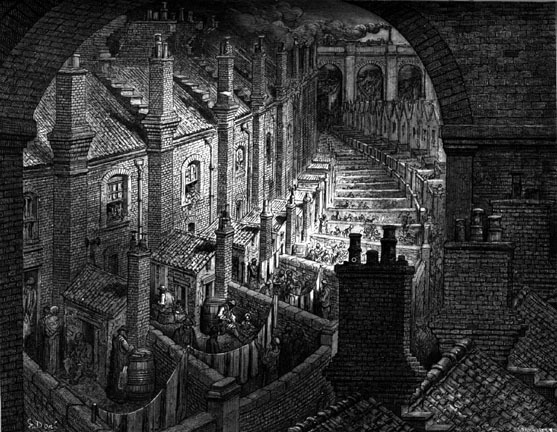 Over London by Rail, by Gustave Doré, shows the cramped living conditions in Victorian London slums, similar to those in Portsea at the time. In Oliver Twist, Dickens employs sarcasm to ridicule the utilitarian men on the Poor law boards as they were ‘very sage, deep, philosophical men’ who had determined that the old poor law system failed to encourage the work ethic. In its place ‘they established the rule, that all poor people should have the alternative (for they would compel nobody, not they) of being starved by a gradual process in the house, or by a quick one out of it’. Inmates would receive ‘periodically small quantities of oatmeal; and issued three meals of thin gruel a day, with an onion twice a week, and half a roll on Sundays’. 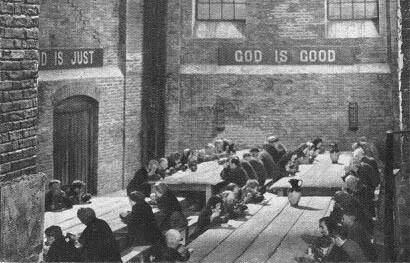 The picture above is St Marylebone workhouse in London. They slunk about, like dispirited wolves or hyenas; and make a pounce at their food when it was served out, much as those animals do. Tightly packed houses in ‘Devils Acre’ Portsea. The harbour is just of of sight to the left of the picture and Milldam barracks are in the top-right. In Victorian society, the fear of poverty and destitution was an ever present threat for most working people. In Portsmouth, as in many other towns, those in need were a large element of the community. In Portsea alone, during the worst of the depression in 1818, some 955 men, women and children were in the Parish workhouse. 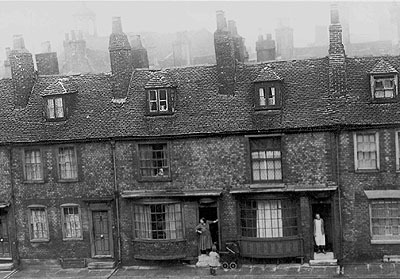 Later, in 1834, it was calculated that in Old Portsmouth one person in eighteen was classed as a pauper by either receiving an allowance (out relief), or living in the workhouse. Similarly, in 1863, one in fourteen of the town’s population was classed a pauper. Although private charities or public donations temporarily relieved some of the town’s needy, most relied on the Parish system of relief through the Poor Laws. From 1834, the controversial Poor Law Amendment Act was introduced which was meant to enforce stricter rules for obtaining relief under an elected Board of Guardians. …Their former occupations are of mixed character – they are employed in picking oakum for His Majesty’s Dockyard. The younger females are employed in carding, and spinning, and making stockings for the use of inmates; also plaiting of straw, and making hats and bonnets, for the girls and boys. The elder are employed in the internal economy of the house as Teachers, Nurses, cooks, washerwomen, seamstress etc…The sick, aged and impotent are accommodated in smaller apartments, and their diet is different; they are allowed, in most cases, tea, a better sort of beer; and, if ordered by the surgeon, wine or spirits…The inmates may be considered to embrace three classes; the destitute Infant Poor, who must out of necessity be inmates; the profligate, from disease and bad character; and the aged and impotent. The infant poor are looked after in the house by the mother or under a proper nurse. Weekly out relief for 991 of which 434 are widows. The whole number including all their families is 2214 persons. Overseers who distribute out relief are familiar with the habits of the poor. Persons receiving permanently weekly aid have to appear before the committee of Churchwardens and Overseers every week. Relief given is less than most temporary employment – many have received wages sufficient to provide against want of work but from idle and improvident habits are necessitated to apply to the Parish…….beer-shops encourage improvident habits; the character of the Applicant is well considered on dispensing parochial aid. Out relief was prohibited unless carefully vetted by the Guardians but generally the able-bodied person had to be destitute to receive relief. The Poor Law Board intended that the able-bodied should fare no better than the poorest labourer. As the provision of food, clothing and accommodation were adequate and often better than someone struggling on low pay the only deterrent lay in the loss of freedom, a monotonous routine, strict discipline and mundane or disagreeable which included tasks such as stone-breaking, oakum-picking, sack-making or corn-grinding. About twenty people were employed in the Workhouse but important in the daily life of the inmate was the Task Master who controlled the routine and allocated work. Breaking House rules usually brought swift punishment. On one occasion four women including Mary Stacey and Elizabeth Walker returned late from Church leave. They had obviously been in a beerhouse as Elizabeth Walker was deemed intoxicated for which she was not allowed to leave the premises for four months. It seems Mary Stacey was a consistent offender. Stacey and another woman Mary Ryan broke leave rules again by staying out all night following afternoon leave granted on the occasion of Queen Victoria’s wedding. Both were sentenced to pick 10 lbs of oakum per day for one month and have their meat allowance stopped. Mary Stacey did eventually leave the workhouse three months later to go into domestic service. While the Poor law system fell into decline due to the emergence of trade unions, friendly societies and the Liberal welfare reforms during the early twentieth century, the Poor law was not officially abolished until 1948. The dark and foreboding Union workhouses that were built after 1834, struck fear into many of the poor and, with the help of Dickens, became a symbol of the harsh realities Victorian industrialisation.